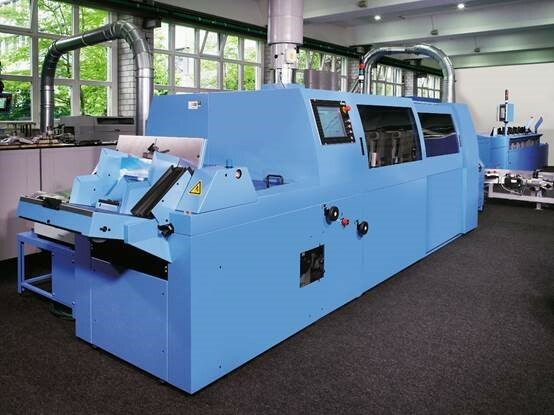 After meeting its saddle stitching needs with a Valore 14 years ago, PieReg Druckcenter Berlin GmbH is now again turning to Muller Martini for its perfect binding needs by installing a Pantera (photo). In-house pre-press with typesetters, typographers, typescript editors and media designers, three sheet-fed offset printing presses with a total of 16 printing units, four folding machines, one saddle stitcher – “the only thing missing was a perfect binder,” says PieReg owner and managing director Sven Regen. This summer, the company. founded in 2004 whose 48 employees work on traditional commercial printing projects, will close this gap with a comprehensive production line from Muller Martini. The production line comprises a 12-station 3692 gathering machine, a Pantera perfect binder with PUR and a Granit three-knife trimmer.